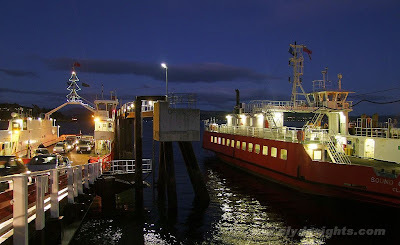 For a couple of weeks each year, Western Ferries' SOUND OF SANDA has undergone a minor transformation as her crew get into the festive spirit, renaming her (unofficially, I hasten to add!) 'SOUND OF SANTA'. To add to the effect, she carried a 'Christmas Tree' in lights on her mast. She is seen here at Hunter's Quay with newer sibling SOUND OF SCARBA.